Recently, the White House instructed Cabinet secretaries to cut 5 percent from their budget for next year. “Time for another hiring freeze,” you may have thought to yourself. Faced with pressures to substantially reduce spending, organizations often follow a familiar script: Impose hiring freezes. Stop payments to consultants. Delay expenditures such as training. Redraw organizational charts to save overhead. These “solutions” may address the immediate challenge, but the underlying economics of the department remain largely unchanged. Which means you’ll probably have this challenge again. And again. And again. With increasing budget deficits, the federal government could be wrestling with significant budget constraints for a long time to come. 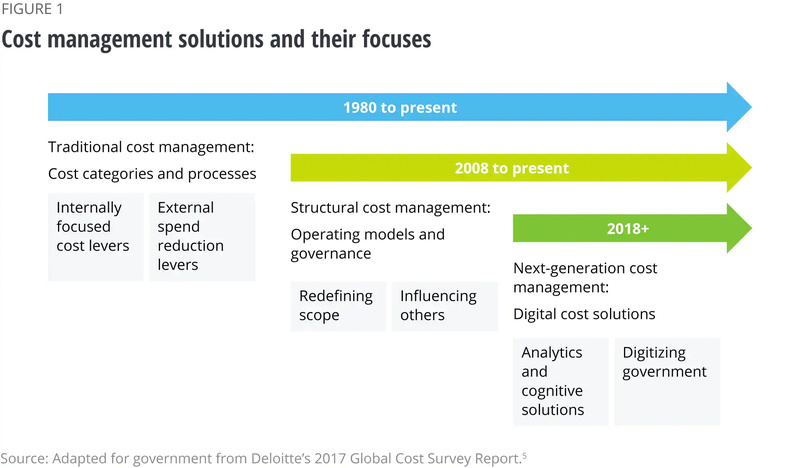 In 2017, Deloitte’s first biennial global cost survey identified three generations of cost management approaches—next-generation, traditional and structural—that commercial enterprises have developed. Can they be applied to government in a way that can help us rethink the very economic model of each agency? We think they can. Next-generation cost management is all about using emerging technologies to fundamentally reduce the costs of doing business. It includes the use of analytics (often supported by artificial intelligence) to increase effectiveness, robotics to automate and augment labor, cloud computing to lower IT costs and blockchain to facilitate transactions. Human capital is generally the most critical resource an agency manages, often exceeding one-third of the total budget. 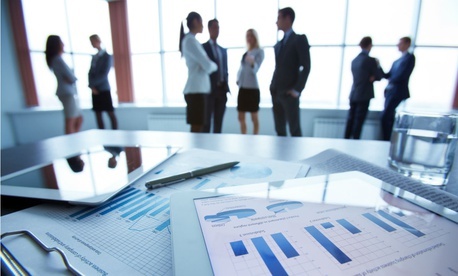 Data analytics can help agencies optimize staff allocation. Pennsylvania’s Bureau of Child Support Enforcement uses analytics to create a “payment score calculator,” which advises about caseworker outreach to noncustodial parents. This is designed to free frontline employees to handle higher-value, more mission-focused tasks. Meanwhile, cloud computing lets agencies convert large, upfront fixed investments (and subsequent maintenance costs) into lower operating costs that can flex capacity as demand requires. Cloud also enables new approaches to mission costs. For instance, the cloud provides a place to store and analyze the masses of data that agencies such as the Defense and Homeland Security departments and NASA collect from remote sensors—part of the rise of the Internet of Things (IoT). Think about shared services for mission-focused activities, not just back-office. You may find that another federal agency, a state agency, a nonprofit, or even a commercial enterprise can better handle some of those functions. Evaluate your agency’s activities to determine which ones make effective use of resources. Then, apply evidence-based funding, which shifts funds to programs that yield better mission-related returns per dollar. Consider “nudges” to get citizens to engage with government via the least-expensive channels. In the United Kingdom, for instance, nudges persuade citizens to go online to renew their permits for disability parking, rather than fill out costly paper forms. Are there any policy constraints that bind your agency to expensive practices? For example, the law may require agencies to publish public notices in the newspaper, but does that costly tactic make sense in the internet age? A change in legislation or regulation may help. Traditional cost management typically disaggregates the enterprise into discrete pieces—cost categories, processes, purchased commodities. It then applies proven methods to cut costs by improving productivity, leveraging scale, and eliminating waste. Government agencies have often deployed traditional cost management in a tactical, narrow, localized manner: hiring freezes, cut back on expenditures like training, etc. Sound familiar? When combined with next-generation and structural approaches, however, traditional cost tools can be transformative. For instance, combining functions to discover economies of scale can eliminate wasteful redundancies and cut overhead costs. The next stage of shared services, however, is what we call service delivery transformation. This broad-scaled approach encourages integration of support services within and across agencies to achieve maximum economies of scale and other efficiencies while also expanding sourcing options to include alternative government and commercial providers and new models for service delivery and funding (including shared gains, for example). As a way to streamline back-office service operations throughout the department’s 12 bureaus and the office of the secretary, the Commerce Department is expected to become the first cabinet-level department to adopt an enterprisewide combined service delivery model for all human resources, financial management, information technology (IT), and acquisition support systems. Procurement is another traditional area of focus that offers new opportunities. For example, technology now enables centralized acquisitions systems for economies of scale, and decentralized purchasing for quick response. An agency may transform its fundamental acquisition model and mindset by using a technique such as agile software development, driving lower costs and more nimble development and implementation. An agency can use emerging technologies to integrate its supply chain, and enable a seamless flow of materials and information. The result is less waste and improved speed, agility, quality, cost, service and innovation. Pressure to reduce costs is not new, and it’s likely not going away. Population growth, demographics, entitlement programs, new security threats and more continue to push the cost of government upward. What is new, are the tools that government leaders have at their disposal. Employing these three cost management approaches together can transform an agency’s economics, while improving mission delivery and services to citizens and businesses. Bruce is a managing director with Deloitte Consulting LLP in the U.S. strategy service line Monitor Deloitte. William D. Eggers is the Executive Director of the Deloitte Center for Government Insights.